John the Baptist was one of the greatest men that ever lived. His father Zacharias, a godly priest in Israel, was offering the daily incense in the temple when the angel Gabriel appeared to him alongside the altar (Lk. 1:5-25). Announcements The angel told him that he and his wife were finally going to have a child in their old age. They were to name him John. He would be a great man. He was not to drink alcoholic beverages, and he would be filled with the Holy Spirit from his mother’s womb. The angel explained that John would “turn many of the children of Israel to the Lord their God. He will also go before Him in the spirit and power of Elijah, ‘to turn the hearts of the fathers to the children,’ and the disobedient to the wisdom of the just, to make ready a people prepared for the Lord” (Lk. 1:16-17). Luke 1:67-79 tells us that Zacharias understood this to mean that John would be the forerunner of the Messiah, as promised in Malachi 3:1. All four of the Gospels contain a prophecy about John that is parallel to Isaiah 40:3. He would be “the voice of one crying in the wilderness: ‘Prepare the way of the Lord; make straight in the desert a highway for our God’” (Mt. 3:3; Mk. 1:3; Lk. 3:4; Jn. 1:23). John lived in the deserts of the hill country of Judea (Lk. 1:39,80). His food was locusts and wild honey, and he dressed like Elijah did (Mt. 3:4; 2 Ki. 1:7-8). At the appropriate time he began preaching: “repent, for the kingdom of heaven is at hand” (Mt. 3:1-3). 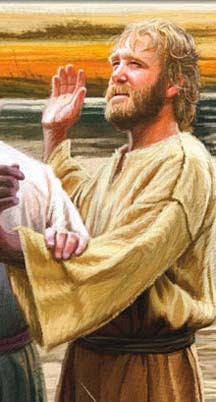 He preached in the wilderness along the Jordan river. So many Israelites from Judea and Jerusalem were baptized by him that everyone began calling him “John the Baptist” (Mt. 3:1). In anticipation of the long-awaited Messiah, these people confessed their sins and received John’s “baptism of repentance” (Mk. 1:4-5). When Jesus came to be baptized, John was reluctant to administer his baptism of repentance to a man so righteous that He had no sins to confess. But Jesus insisted; He wanted to show the Israelites that confessing their sins and repenting was the way to gain entrance into the kingdom of God. As Jesus came up out of the water, the Holy Spirit descended on Him in the form of a dove and a voice from heaven announced, “This is My beloved Son, in whom I am well pleased” (Mt. 3:13-17). This was John’s cue that Jesus was the Messiah whose coming he had been announcing, so he began pointing out that He was the “Lamb of God who takes away the sin of the world” (Jn. 1:29-34). John the Baptist was a stand-in for the prophet Elijah. Although the angel had said that he would come in the spirit and power of Elijah, John denied that he was Elijah (Jn. 1:19-28). But Jesus told the multitudes that John was Elijah: “If you are willing to receive it, he is Elijah who is to come” (Mt. 11:14). In other words, though he was not actually Elijah, he was enough like him to be a fair fulfillment of the prophecy of Malachi 4:5-6. It is possible that Elijah will be sent in person to get Israel to repent during the Tribulation period (Rev. 11:3-6). At the end of that time the Jewish people will repent of rejecting Christ, and He will set up His world-wide kingdom in Israel (Zech. 12:10-14; 14:16-21). Jesus responded immediately by healing many people of their infirmities. Then He instructed John’s disciples to go back and tell him what they had seen Jesus do. He knew that John would recognize that He was indeed the Messiah by fulfilling another of Isaiah’s prophesies: “Then the eyes of the blind shall be opened, and the ears of the deaf shall be unstopped. Then the lame shall leap like a deer, and the tongue of the dumb sing” (Isa. 35:5-6). It was in the context of John’s failure that our gracious Savior told the multitudes, “Assuredly, I say to you, among those born of women there has not risen one greater than John the Baptist” (Mt. 11:11). John the Baptist was great because He consecrated himself to God. The angel’s warning that he was not to indulge in alcohol suggests John’s consecration to the Nazirite’s vow (Num. 6:1- 21). If John did not take the vow of a Nazirite, he certainly lived in the spirit of it. Where he lived, what he wore, and what he ate suggest that the things of God were more important to him than the things of earth. Jesus testified that “He was a burning and shining light” (Jn. 5:35). He burned with the fervor of godliness, and did not hide his lamp under a basket (Mt. 5:14-16). John the Baptist was great because he was faithful to God’s calling. He literally became a voice crying in the wilderness urging Israel to “prepare the way of the LORD” as prophesied. He tirelessly preached a gospel of repentance, and became a martyr – faithful unto death – for reprimanding Herod for his sins. John the Baptist was great because he was willing to lay aside his own popularity in deference to Christ. When he was told that many of his disciples were leaving him to follow Christ, he said: “He who has the bride is the bridegroom; but the friend of the bridegroom, who stands and hears him, rejoices greatly because of the bridegroom’s voice. Therefore this joy of mine is fulfilled. He must increase, but I must decrease. He who comes from above is above all; he who is of the earth is earthly and speaks of the earth. He who comes from heaven is above all” (Jn. 3:25-31). Jesus was not disparaging the greatness of John the Baptist when He added this to his assessment of John: “But he who is least in the kingdom of heaven is greater than he” (Mt. 11:11). He was pointing out that the greatness of the present cannot compare with the greatness of a future in the kingdom of God. Even the least deserving person in the coming kingdom of God will have more glory than is possible to attain in the circumstances of this present evil world. Actually, the prophets will also be ushered into the kingdom of God to be rewarded for the things done in their lifetimes (Lk. 13:28). May God help us all to strive for His commendation, “Well done, good and faithful servant” (Mt. 25:21-23). What We Can Learn From John The Baptist? God has given each of us a purpose for living, and we can trust Him to guide us. John the Baptist did not have the complete Bible as we know it today, but he focused his life on the truth he knew from the available old Testament Scriptures. Likewise we can discover in God’s Word the truths He wants us to know. And as these truths work in us, others will be drawn to Christ. God can use you in a way He can use no one else. Let Him know your willingness to follow Him today.